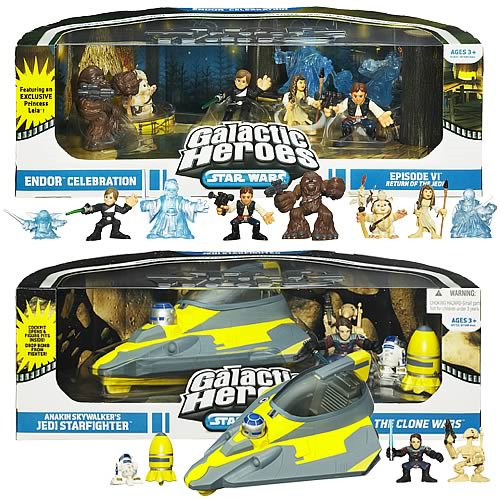 Shopping for Star Wars Galactic Heroes? Calling all Jedi and Sith Lords! Awesome characters from unforgettable movie scenes! Calling all Jedi and Sith Lords! Wookiees and creatures! Ewoks and Jawas! The Galactic Heroes are here! This splendid miniature figure collection features a wide variety of awesome characters from some of the coolest and most unforgettable Star Wars movie scenes. So grab your lightsaber, fire up your X-wing engines, and join in the excitement! Each figure stands approximately 2-inches tall.